The war on drugs is a complete failure everywhere, according a comprehensive review of 20 years of scientific literature released at the Harm Reduction 2010 conference in Liverpool, England that wraps up Thursday. “The war on drugs does not work, period,” said Dr. Julio Montaner, president of the International AIDS Society. “We must take an evidence-based approach to dealing with the drug market, because current strategies are not working and people are paying for ill-considered policies with their lives,” Montaner said in a release. An examination of all English-language scientific literature dating back more than 20 years reveals that drug law enforcement dramatically escalates drug-market violence. Contrary to conventional wisdom, a startling 82 percent of the studies found the various wars on drugs in countries and internationally simply increase violence. Mexico offers a case in point. In 2006, it launched a massive nationwide counter-narcotics campaign. By 2008, drug violence claimed 6,290 lives in that year alone – double the number from the 2007. In first eight weeks of 2009, more than 1,000 people were killed. Since 2006, the total number killed has surpassed 17,000 people, including scores of judges, police, and journalists. 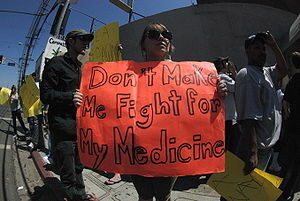 “From a scientific perspective, the widespread drug violence in places like Mexico and the U.S., as well as the gun violence we are increasingly seeing on city streets in other countries, appears to be directly linked to drug prohibition,” says review co-author Dr. Evan Wood, a researcher at the Canada’s British Columbia Centre for Excellence in HIV/AIDS and founder of the International Centre for Science in Drug Policy. The organisation is an international network of scientists, academics, and health practitioners committed to improving the health and safety of communities and individuals affected by illicit drugs. The review was released in Liverpool at the 21st international conference on the reduction of drug-related harm. Harm reduction involves providing access to methadone, needle exchange services, and counselling for drug users. The 26-page report, “Effect of Drug Law Enforcement on Drug-Related Violence: Evidence from a Scientific Review”, notes that drug prohibition has created a massive global illicit drug market, with an estimated annual value of 320 billion dollars. Further, several of the studies included in the report suggested that violence stems from power vacuums created by the removal of key players from the illicit-drug market by drug law enforcement. As police use increasingly sophisticated methods to disrupt drug-distribution networks, levels of drug-related violence may rise. “These findings are consistent with historical examples such as the steep increases in gun-related homicides that emerged under alcohol prohibition in the United States,” the report states. “Prohibition drives up the value of banned substances astronomically, creating lucrative markets exploited by local criminals and worldwide networks of organised crime,” said Wood. While the U.S. currently has 500,000 people in jail on drug offences – five times as many as 20 years ago – the availability of illegal drugs and drug use has not changed. In fact, illegal drugs are cheaper and of better quality, the report observes. “Law enforcement is the biggest single expenditure on drugs, yet has rarely been evaluated. This work indicates an urgent need to shift resources from counter-productive law enforcement to a health-based public health approach,” Stimson said. Laws criminalising drug use “must be repealed”, he said. Two of three major British political parties during the run-up to parliamentary elections have gone on the record as wanting an informed debate on drug decriminalisation. That’s an encouraging development, says Stimson, who hopes that Britain will take the lead on this issue. “If we accept that people consume drugs, then we need to accept that people produce drugs and protect the rights of poor producing communities,” he said in a release. Originally published as “Drug War” Policies Need a Stint in Rehab .